Social Priorities - VSMPO Titan Ukraine Ltd.
Management of VSMPO TITAN UKRAINE LTD. takes part in a kind and very important matter; it provides charity support to a young and talented chess-player Angelika Valkova in preparation and participation in chess competitions. This year Angelika successfully represents Ukraine and Nikopol in a number of current chess competitions including those of the international level. She is a grand-daughter of Valkov Oleg Anatolyevich, chief foreman of heat-treatment area, who has been working in tube rolling mill of the company since 1975 after he had graduated from Kharkov Polytechnic Institute. Newspaper "Prospekt Trubnikov" No. 28 as of April 7th, 2011. Angelika Valkova was awarded with a diploma by Board of Physical Fitness and Sports of Dnepropetrovsk Regional State Administration. A chess competition among youth in two age categories — under 16 and under 18 years — took place in Dnepropetrovsk region during spring vacations from the 21st till the 27th of March. 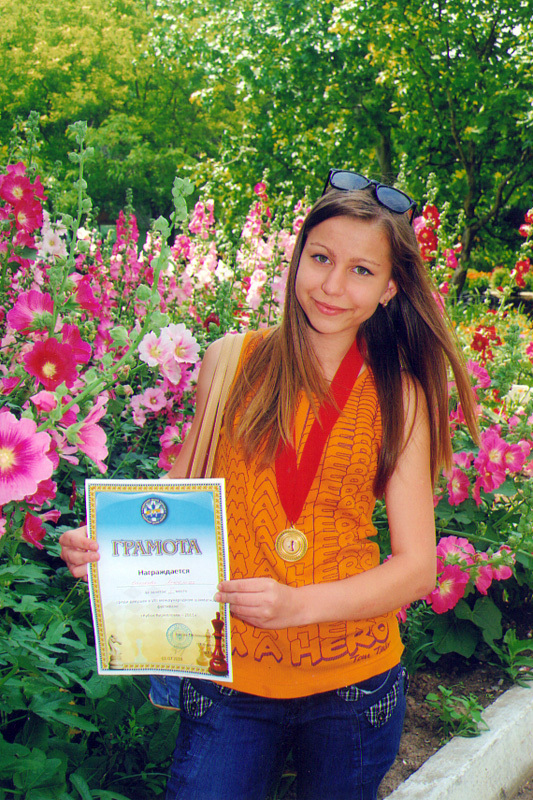 Under supervision of her coach A. Martiyan (Candidate Master of Sports), Angelika Valkova (the 1st degree), the pupil of the 7th form of gymnasium No. 15, was defending the honor of Nikopol. Though last year Angelika took the 2-nd place in her age category, this year, being 13 years old, she won the 1st place among the strongest female chess-players of the region under 16 years and the 3rd place among those under 18. Angelika is an enthusiastic chess-player of our town. For the recent four years she has participated in more than 60 competitions. Her tournament schedule is planned by her mother Inna Olegovna and coach Alexandr Vasilyevich for a year in advance to improve Angelika's level and to gain new victories. Let's congratulate our champion and wish her further success. Newspaper "Prospekt Trubnikov" No. 58 as of June 21st, 2011. The first score gained at the age of 13.5! 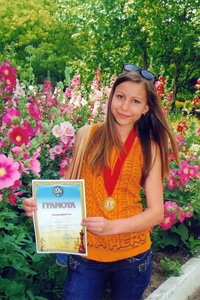 On the VIII International Chess Festival "Cup of Kirillovka-2011", a 1st degree chess-player from Nikopol Angelika Valkova took the first prize among female players and gained the score of Candidate Master of Sports of Ukraine. In the middle of summer vacations, the representatives of three countries: Belarus (Gomel, Rogachev, Mozer), Ukraine (Kiev — 4 societies, Chernigov, Mariupol, Melitopol, Chernovtsy, Nikopol, Baryshevka), Russia (Moscow, St. Petersburg) had a competition on the shore of the Sea of Azov in a sports and fitness complex "Salut". A total of 12 cities were represented by 44 participants. Our young chess-player Angelika Valkova (champion of the region) took part in this festival for the fourth time and in a basic tournament she already was one of 26 experienced chess-players along with two Masters of Sport, three Candidate Masters of Sport and four first degree players with high rating. Angelika won a confident victory in a chess-match against bronze medalist of Belarus, Candidate Master of Sports L. Boldovskaya. She ended a match with silver medalist of Belarus, Candidate Master of Sports E. Filipets (the second place in overall standings) in a draw. Another victory was gained against a champion of Donetsk region E. Vasilenko, and she worthily lost a match with a Muscovite, Master of FIDE S. Beryukov (winner of the competition). A real sensation of the 9th tour was victory over another Muscovite, national Master of Sports of Russia and Japan K. Cherevko. By winning 5.5 points from possible 9 (50% for Master of Sports, 50% for Candidate Master of Sports and 80% for the 1st degree), she gained the score of Candidate Master of Sports of Ukraine. Due to this, Angelika managed to win the first place among female players and get a medal, certificate, and money prize. In overall standings she took the sixth place in a strong team of experienced chess-players. On final meeting chief referee Yu. D. Kutsenko (Chernigov) especially emphasized Angelika's mature and confident way of playing and apparent progress for the recent year. As well he expressed confidence that being the leader of Nikopol and Dnepropetrovsk region, she will be able in future to show high professionalism and win prices in championship of Ukraine. For almost four years her coach, distinguished chess-player of Nikopol, Candidate Master of Sports, Martiyan Alexandr Vasilyevich, has been preparing Angelika for competitions. He spares neither efforts nor time for systematic and intensive training that are held between Angelika's studying at gymnasium No. 15 and English and German classes at school "Victoriya". By the way, the coach made progress along with his successful pupil and "synchronously" took part in a great Ukrainian tournament (257 participants) in Mukachevo (Zakarpatskaya region) and won the sixth place among 75 players (6 points from 9). The winner of the Tournament was our landsman from Dnepropetrovsk, Grand Master I. Kovalenko. Essential contribution to Angelika's achievements was made by her mother Inna Olegovna, diligently and persistently performing her duties not only as a mother but also as a manager, organizer of chess training, doctor and psychologist. Successful participation of Angelika Valkova during current year allow her to make serious plans, among which there are semifinal of Ukraine (female players under 16) and championship of Nikopol taking place this autumn. Let's congratulate our young chess-player and wish her new victories and the soonest completion of a norm for Candidate Master of Sports of Ukraine.